The two were in line to see St.
Peter at the Pearly Gates. Peter asked the lawyer his name and looked it up in his book. He then asked the Pope for his name, and looked it up in his book also. "Now, if you will come with me, I will show you your eternal dwellings," said St.
Peter turned to the lawyer and told him this was to be his house. Peter and the Pope continued on to a small, beat-up wooden shack. Peter told the Pope that this would be his dwelling. 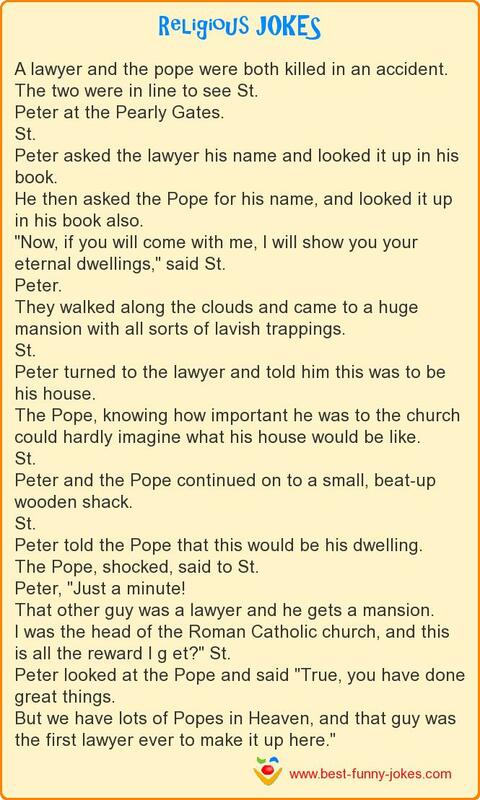 The Pope, shocked, said to St.
That other guy was a lawyer and he gets a mansion. I was the head of the Roman Catholic church, and this is all the reward I g et?" St.
Peter looked at the Pope and said "True, you have done great things. But we have lots of Popes in Heaven, and that guy was the first lawyer ever to make it up here."